I love speaking to groups: medical or health communities, conferences, corporate events, churches, and other organizations. Please contact me to make arrangements to speak before your group. 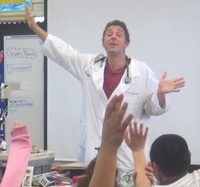 Dr. Nick Yphantides was asked to speak at the 58th Annual California School Nurses Association CSNO Conference. He spoke to over 600 nurses from all over California about his own personal journey about changing his life and his commitment to advocating for children and their health. The nurses commented on how he not only gave valuable information and statistics regarding the health of our children but also inspired each of us to evaluate our own health habits and how that influences the children we are dealing with on a daily basis. He not only provides valuable information but also uses humor in his presentations. Dr. Yphantides was well received at our conference and many are anxious to hear him speak again. He has a passion and commitment to help others improve their health. He was an inspiration to the nurses at the conference. It was an honor to have witnessed Dr. Nick share his life-changing story at our YMCA. 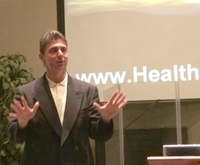 His inspirational presentation of his personal transformation left the hundreds of people that came to hear how “My Big Fat Greek Diet” could change their life for the better believing that they could do it as well. As current obesity statistics continue to shed light on quality of life issues and future health implications, I believe that testimonials such as Dr. Nick’s will be the medicine of choice. His message was passionate, inspiring, and entertaining. I consider him a poster boy for YMCA advocacy and for sensible weight loss. If you are searching for a speaker to share an inspiring message about making it happen in life, you need to look no further. At a recently concluded National Membership and Marketing Conference held in Chicago , 800 + participants were treated to a dinner program not soon to be forgotten. Dr. Nick Yphantides shared a very moving story of transformation, supported by his membership with the San Diego YMCA. WOW! Not only was the core message great, but the way in which it was told was inspiring. From his powerful message, many were brought to tears and left with a feeling of true accomplishment for the work we do in our YMCAs. A truly outstanding speaker and great storyteller that we are proud to call YMCA Member and friend. Being a retired broadcaster with some 25 years in the business, I have heard many, many speakers. I have a good ear for talent, and for the delivery of a profound message. I don’t believe I’ve ever heard a more compelling speaker than Dr. Nick Yphantides. His is a story that holds the audience spellbound. We marvel at the accomplishment he achieved in losing so much weight and getting his body in trim. With so many of us it is just wishful thinking. Dr. Nick, as he is affectionately known by his friends, showed not only that it can be done, but how it can be done. Having heard Dr. Nick speak on several occasions, we were so impressed with his presentation that we decided to do a cover story, in full color, on Dr. Nick and his achievements’. We publish a weekly newspaper of 20,000 circulation. His story is still one of the more popular issues we have published and we received many favorable comments on the story. We are not only proud of Dr. Nick but we are proud to know him. He is a man of many accomplishments, a man of honor, a man of compassion, a man of faith, he is a fine human being and a marvelous speaker. 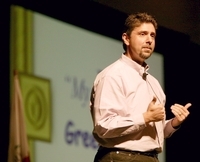 If you are seeking a speaker that will hold your audience’s attention . . . book Dr. Nick. He is awesome. I highly recommend Dr. Yphantides to anyone seeking thoughtful and "out-of-the-box" guidance in achieving mastery of one’s health and well-being. He brings a truly novel approach to everything he does in his career and personal life. His use of humor and story telling ability to push the edge of one’s thinking of their personal health and that of their own community is among the best I’ve ever heard. He has helped thousands of patients and friends broaden their own problem-solving skills and given them renewed hope and new insights into being healthy and alive. 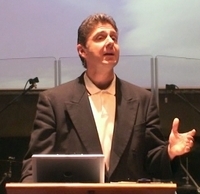 Whether sharing with our church congregation on Sunday morning, teaching our youth about sexual purity, or preparing cross-cultural workers for service in other countries, Dr. Nick Yphantides is an incredible and unforgettable communicator. His transparency, vulnerability, humor, and passion, along with a thorough knowledge of an incredible array of subjects, always leaves a lasting impact on his listeners. On behalf of the leadership of The Gathering of Men in Southern California, it is my joy to extend to you my thoughts related to Dr. Nicholas Yphantides and his service to our organization. 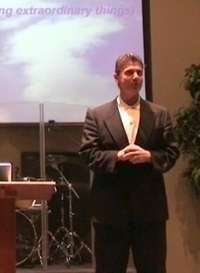 "Dr. Nick" spoke for three of our business events in 2003. He was well received by the 600 men who attended these events. 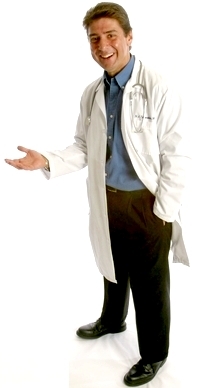 In all my interactions with Dr. Nick I found him to be an individual of unique professional qualities. I observed him carefully during his service at our Pasadena, Torrance, and Anaheim events. Each event required his willingness to communicate with passion and then interact personally with the men who attended. Dr. Nick hit "home runs" as he shared his story at each event, and then he listened to our ideas and points of view after each event because his desire was to communicate effectively and grow in his service to his listeners. Dr. Nick is a man of integrity, as he demonstrated on several occasions by making statements to me as to what he was planning on communicating and then following through on those plans. I enjoy working with men who state what their intentions are and then keep their word, as Dr. Nick did time and time again. Without reservation I highly recommend Dr. Nicholas Yphantides for consideration as a public speaker by your organization.